Please note that the content of this book primarily consists of articles available from Wikipedia or other free sources online. 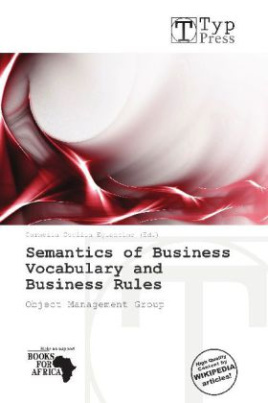 The Semantics of Business Vocabulary and Business Rules (SBVR) is an adopted standard of the Object Management Group (OMG) intended to be the basis for formal and detailed natural language declarative description of a complex entity, such as a business. SBVR is intended to formalize complex compliance rules, such as operational rules for an enterprise, security policy, standard compliance, or regulatory compliance rules. Such formal vocabularies and rules can be interpreted and used by computer systems. SBVR is an integral part of the OMG s Model Driven Architecture (MDA).